The production of viral vaccines in cell culture can be accomplished with primary, diploid, or continuous (transformed) cell lines. Each cell line, each virus type, and each vaccine preparation require the specific design of upstream and downstream processing. Media have to be selected as well as production vessels, cultivation conditions, and modes of operation. Many viruses only replicate to high titers in adherently growing cells, but similar to processes established for recombinant protein production, an increasing number of suspension cell lines is being evaluated for future use. Here, we describe key issues to be considered for the establishment of large-scale virus production in bioreactors. 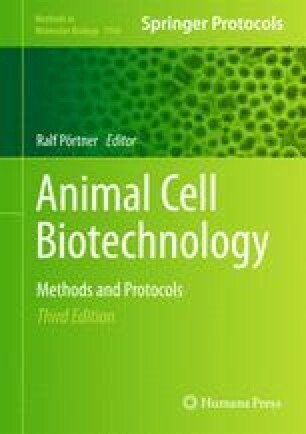 As an example upstream processing of cell culture-derived influenza virus production is described in more detail for adherently growing and for suspension cells. In particular, use of serum-containing, serum-free, and chemically defined media as well as choice of cultivation vessel are considered. The authors thank N. Wynserski, C. Best, S. König, and I. Behrendt for their excellent technical assistance. The authors would like to thank I. Jordan (ProBioGen AG) for the fruitful discussions on the AGE1.CR cell line and for allowing us to use this cell line. Equally, the authors thank B. Hundt (IDT Biologika GmbH) for the provision of the egg-derived influenza virus.